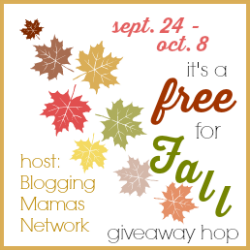 Welcome to the It's a Free for Fall Giveaway Hop, hosted by the Blogging Mamas Network. The days are getting a bit cooler and Fall is just around the corner! We're celebrating the upcoming season with a fun giveaway hop. Each blogger in the hop has a prize for you worth at least $25, so don't forget to hop around to them all in the linky at the bottom of this post. So Easy Being Green, Viva Veltoro, the Blogging Mamas Network, and the Free for Fall participating bloggers are not responsible for sponsors who do not fulfill prize obligations. I would love to win this for our family! I'd give this to my friend's son on his birthday. If I won I would love to give to my nephew he would love it! I would give this to my grandbaby. She would enjoy it! I would give this to my youngest grandson if I win! Would gift to my grandson. Paula C.
I would give this to my new niece! I would give this to my daughter! this would be for my grandson. I would give it to my daughter who had the forest play set so this would help complete her set! I would keep it at my house so my grandchildren could play with it. this would go to my nephew. This would be for my friend Adanna first born! I would give this to my granddaughter. Our almost 3 year old nephew! I'd give this to my next to littlest grand. Such a fun looking toy! I would give this to my youngest son. I'd give it to my granddaughter. This would go to our nieces! This would be for my 2 kids to share - they would love it! I would give to my daughter!! I would give this to my daughter, her brother would enjoy it too. I would love to give it to my son for his birthday! I would give this to my great niece. This would be going straight to my granddaughter & she would LOVE it!! I'd give it to a friend's toddler for birthday or christmas. I would give this to my best friend's little ones! I would give this to my nephew. I would give this to my daughter. she would love this. I would give this to my grandson -- by Christmas he will be the perfect age for it. I'd give this to my daughter for her first birthday coming up. If I won this would be for my 2 year old daughter. This would be for my little grandson - he would love it! I would donate too Christmas drive for needy child. This would be great for our granddaughter. I would give this to my youngest son! I would give this to my daughter, she would love it. I would give it to my nephew Isaac! I would give it to my son,he would love it! Thanks for chance! I would give this to my kiddos. Both my son and daughter would love it! My son would love this! I would love to win this awesome vTech giveaway for my niece Stella. I'd love to win this for my nephew! Our little girl would get this. I would give this to my daughter. I would give it to my kids. my husband's nephew would love this. I would give this to my youngest grandson should I win. I know he would enjoy it. I would donate it to Toys for Tots if I won. If I won, this would be for our granddaughter. Oh I would love to give this to my grandson! He would love it! I would give this prize to my youngest son. Thanks! I would give this to my son for Christmas. I would love to win this for my son. I would give it to my great nephew if I was lucky enough to win. He would love it. I would give it to my nephew. I would give it to my son. I would either give it to my son or my nephews! Thanks! This would be for Big Earl! If I won, I'd give this to my son. He'd love it so much! I would love to win this awesome Go! Go! 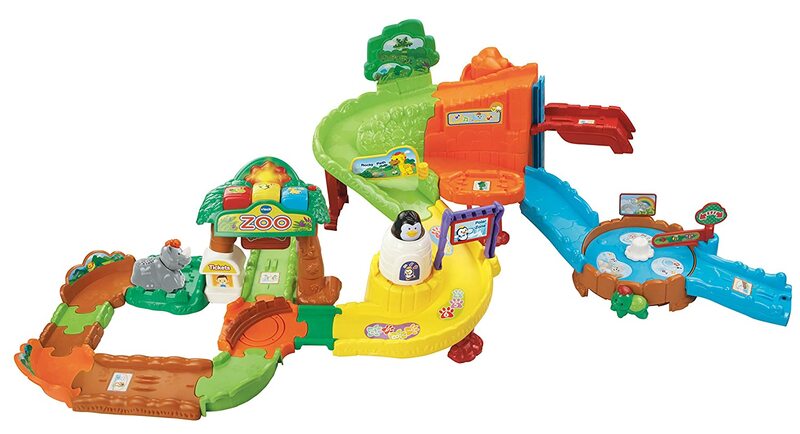 Smart Animals Zoo Explorers Playset for my son, nieces and nephews! This would be a great toy for my youngest son! It looks like a fun toy. I would keep it for my youngest due in early February! I would keep it for my daughter to play with it with her little brother or sister due next spring! I would give this to my daughter for Christmas! If I win I would give this to my nephew for Christmas. I would give it to my youngest granddaughter. We would keep it for our little one. I would save it for our little girl for Christmas! I would love to win this for my little nephew. I would give this to my niece from the Great Halloween Pumpkin. I would give this to my nephew if I won! I would give this to my son and daughter to play with together. This would be a great birthday present for my daughter!